I was asked to build a gift for my Lego User Group (LUG), The Brickish Association, to present to the CEE Team during a visit to Billund. The Union Jack is the British flag and I thought I could use a technique called ‘greebling’ to add some very ‘British’ detail. Greebling is a technique used give texture and complexity to a build through the use of intricate, detailed parts – it is fun but can be fiddly at times. The umbrella was a central point as we are naturally obsessed with the weather and is a common conversational subject if you are lost for words. I wanted to highlight some very British inventions such as the vacuum cleaner and the telephone but also give some nods to our culture, the Tardis of Dr Who fame, the picnic, Robin Hood and his quiver full of arrows, a guitar representing our musical heritage and lots of cups of tea. The flag even has a mapping effect for the UK. London in the South East of the flag has a red bus and a London Eye whilst Cornwall over in the South West has beaches famous for their surfing and life guard requirements. The north has a more industrial feel in the blue area with a bike placed over Yorkshire where the Tour De France held their Grand Depart in 2014. 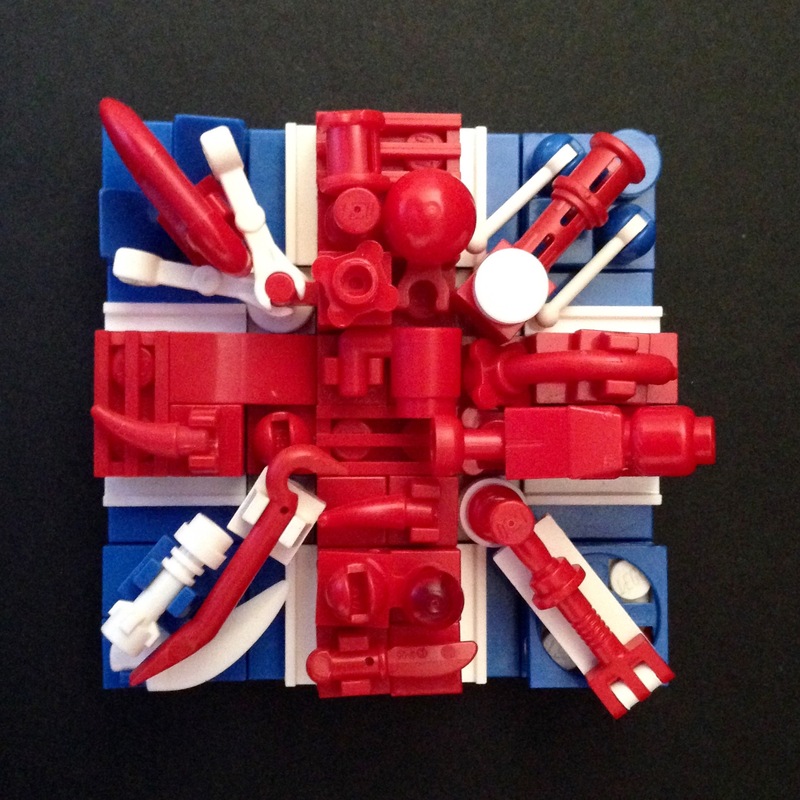 Categories: Lego, MOC | Tags: azurebrick, creation, Flag, Great Britain, Greebled, Greebling, Lego, UK, Union Jack | Permalink. Greebles: Pseudo-technical detail added to a LEGO creation to enhance its appearance. Frequently seen in LEGO space and mecha creations. The Flag of Great Britain with the three colours of the Union…Red, White and Blue. (places right hand on heart in a dramatic fashion ). Note the cup of tea central to being British! – Your greebles may not use any gray colors. Categories: Greebles, Lego | Tags: Britich, Flag, Great Britain, Greeble, Greebled, Greebles, Greebling, Lego, UK, Union Jack | Permalink.